Conozca Fremantle, la histórica ciudad portuaria de Australia Occidental al sur de Perth, en este recorrido a pie. Con una guía, pasearás por callejuelas y calles llenas de arquitectura bien conservada, aprendiendo sobre la interesante historia de la ciudad y la cultura moderna. Visite lugares como el Ayuntamiento del siglo XIX y Fremantle Roundhouse, el edificio más antiguo de Washington, y disfrute de la Franja de Cappuccino, una bulliciosa zona de cafés populares. Limitado a 12 personas, este recorrido a pie ofrece una experiencia de grupo pequeño. 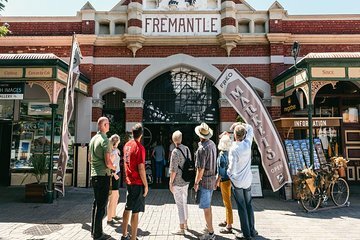 Escucha las historias pioneras que ponen a Fremantle en el mapa. El tour en grupos pequeños con un máximo de 12 participantes garantiza una experiencia personalizada con un guía. Su recorrido a pie por Fremantle, que se encuentra justo al otro lado del río Swan desde Perth, comienza en el Centro de Visitantes. Encuentre a su guía aquí para su viaje en el tiempo para aprender sobre la historia de la ciudad, desde sus orígenes como puerto pesquero hasta su reputación actual de cafés, arte local, tiendas, microcervecerías y música en vivo. Admire el Ayuntamiento, que se ha mantenido prácticamente sin cambios desde que abrió sus puertas en 1887, proporcionando un excelente ejemplo de la arquitectura del siglo XIX. Luego pase por las calles estrechas, haga una pausa para tomar fotos y escuche historias de su guía sobre diversos eventos que ayudaron a dar forma a esta ciudad portuaria. Cuando llegue a la Franja de Cappuccino, admire la animada zona de cafés y restaurantes donde los locales y los visitantes se relajan en las mesas al aire libre para observar a la gente. La última parada de su recorrido es Fremantle Roundhouse, la estructura más antigua de Australia Occidental, que fue construida como prisión en 1830. La distancia total a pie es de aproximadamente 2 millas (3 km). I enjoyed the tour of Fremantle immensely. Ryan, the tour guide was extremely knowledgeable and considerate of everyone in the group. The tour was not overbearing relative to walking for 2 hours as there were plenty of times for breaks. Ryan even bought us a bakery treat to share which was very gracious of time. I would do this tour again in a heartbeat! Despite having to dodge the rain showers we had a very informative and enjoyable tour of Freo . Highly recommended. Can’t recommend this tour highly enough. The guide was witty, knowledgeable and highly entertaining. We visited parts of the town that we wouldn’t have on our own and got a great run down on the history of Fremantle and a grasp of what’s happening now. Our excellent guide, Vaughan, gave us there were only two in the group a memorable morning in Fremantle. His depth of knowledge, enhanced by a wealth of anecdotes and stories, brought the history of the city to life. His character and sense of humour added further to our enjoyment. I recommend this tour unreservedly it was one of the highlights of our holiday in Australia. With only one full day in Fremantle I was keen to see and learn as much as I could about this beautiful town. Well I certainly wasn't disappointed - I met Dave at the newly restored Town Hall and went from there - so much to see, so many amazing buildings, especially the Prison which has an international heritage listing. Fabulous couple of hours spent with Dave whose knowledge and passion for Freo was fantastic - definitely highly recommend this tour. Rusty is a cool dude. A very nice walking tour of Freo. Learned a lot about the old Freo. Had a beer on the way and as I cant walk up steps and hills Rusty took us the easy way. Good time. Great walking tour. My guide talked about the history of Fremantle as we walked around and pointed out the significant land marks. He was able to answer all my questions and recommended places I could spend more time in and other areas to visit. It was a great overview of Fremantle and its history. My American visitor found this very interesting. Being in a small group was ideal as we could always hear the guide's commentary.